Integrate Dynamics 365 Sales data into Java servlets: Use the Management Console in JBoss to install the Dynamics 365 Sales JDBC Driver. CData JDBC drivers can be configured in JBoss by following the standard procedure for connection pooling. This article details how to access Salesforce data from a connection pool in JBoss applications. 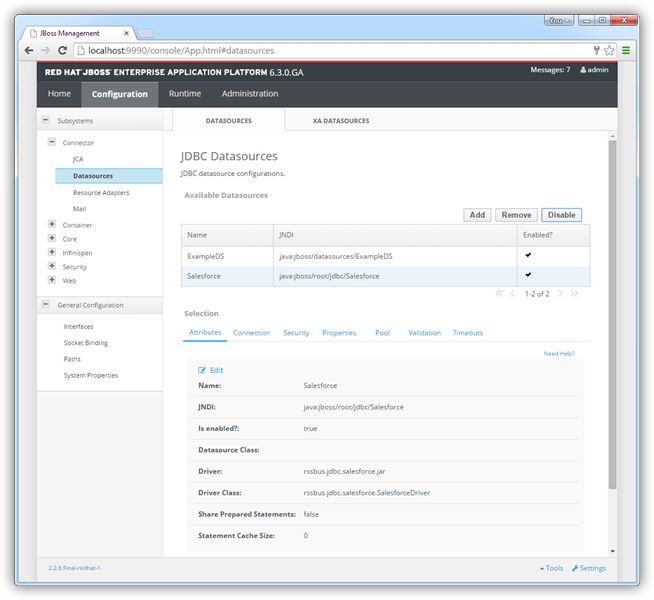 This article details how to use the JBoss Management Interface to configure the CData JDBC Driver for Dynamics 365 Sales. You will then access Dynamics 365 Sales data from a connection pool. Follow the steps below to add the driver JAR and define required connection properties. In the Runtime menu, select the Domain or Server menu, depending on whether you are deploying to a managed domain or to a stand-alone server, and click "Manage deployments" to open the Deployments page. Click Add. In the resulting wizard, add the JAR file and license for the driver, located in the lib subfolder of the installation directory. Finish the wizard with the defaults, select the driver, and click Enable. In the Configuration menu, click Subsystems -> Connector -> Datasources. This opens the JDBC Datasources page. Select the driver that you added above. Enter the JDBC URL and the username and password. The syntax of the JDBC URL is jdbc:d365sales: followed by a semicolon-separated list of connection properties. Dynamics 365 uses the OAuth authentication standard. See the Getting Started section in the help documentation for a guide to completing the process. Test the connection and finish the wizard. Select the Dynamics 365 Sales data source and click Enable. The steps above show how to configure the driver in a simple connection pooling scenario. 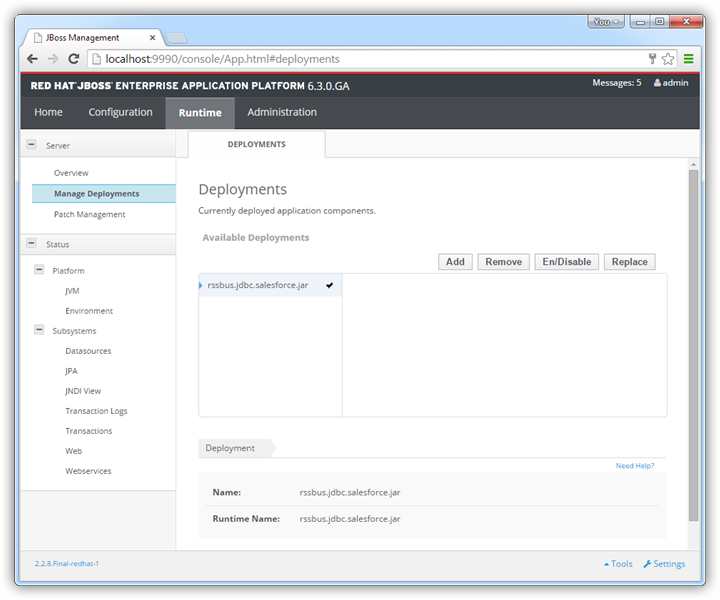 For more information, refer to the Data Source Management chapter in the JBoss EAP documentation.